Michael Milne walking along the border in southern Arizona. We were in the Buenos Aires National Wildlife Refuge in southern Arizona, hiking the high desert landscape in mid-January, amid rocky outcroppings dotted with scrub and the occasional saguaro cactus. Emerging into a clearing, we spied a lone coyote foraging in the tall grass, resembling an underfed German shepherd, oblivious to us. Suddenly, the sound of a vehicle pierced the silence and the animal froze, staring south. We followed its gaze. There was a government-issue SUV. But beyond the vehicle, a hundred yards away, was what startled us: A 15-foot-high fence rose from the ground, undulating with the terrain, its sturdy iron slats limned with rust in the fierce desert sun. We knew we were in the extreme southern part of the state, but only then did a larger fact hit home. We were on the Mexican border. U.S. Customs and Border Protection vehicle along the border. We had come to Sasabe, Ariz., population not much more than a couple of handfuls, to absorb some local history and spend a few days at Rancho de la Osa, which has been welcoming guests since 1926. The property, 70 miles southwest of Tucson, sits just a half-mile from Mexico and has flown Spanish, Mexican, and American flags over its 300 years. The border has been more of a technicality than a barrier, with goods, livestock, and workers flowing back and forth freely. 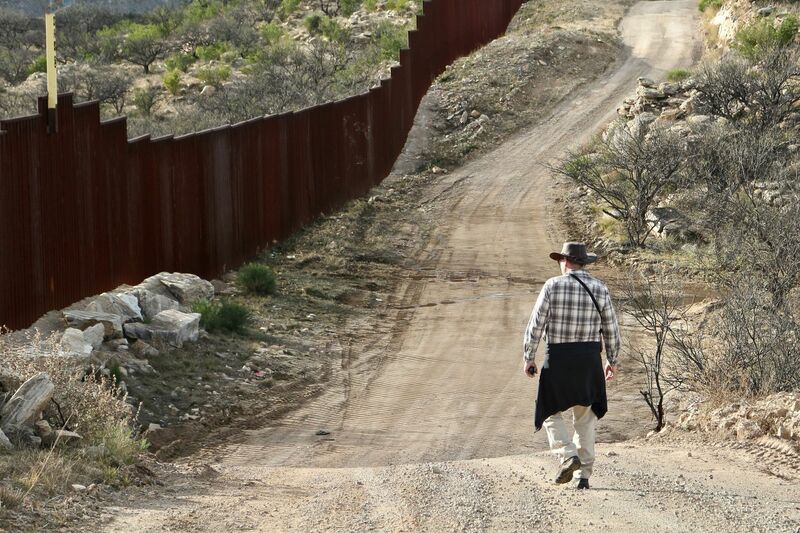 A planned trip to Tucson placed us in the heart of the debate over building a wall or a fence or a barrier along the U.S.-Mexico border, so it was from a traveler’s perspective that we explored the region and the current issues. Inside the Rancho de la Osa, which has been welcoming guests since 1926. Tucson sits at the edge of the Sonoran Desert, a geographic designation that straddles both sides of the national border, creating a culinary, social, and economic culture all its own. Located an hour north of Mexico on Interstate 19, the city is the headquarters of the Tucson Sector of the U.S. Customs and Border Patrol, covering 262 miles and eight border stations, with more than 4,200 agents. The sector is one of the busiest in the country for apprehending undocumented migrants. When we arrived in early November, the deployment of military personnel to the southern border had begun in what was known for a week as Operation Faithful Patriot. The skies were filled with helicopters and C-130 transport planes headed to Davis-Monthan Air Force Base southeast of town, giving the feel of a city under siege. Despite all the frenzy overhead, downtown Tucson seemed much like it has in the past, hopping with an active bar and music scene fueled by University of Arizona students, along with empty-nesters who fly in during the winter from colder climes to play golf and enjoy the sunshine. There was no sense that we’d entered an area undergoing a crisis or emergency. At Rancho de la Osa, we settled into the rhythm of ranch life. It was easy to imagine we were immersed in days gone by, when guests like John Wayne, Eleanor Roosevelt, and Margaret Mitchell strode the grounds. We were curious about being so close to the border and talked with Lynne Knox, who manages the property with her husband, Ross, and who is a longtime Tucsonan who moved to the ranch three years ago. “I’ve never lived so close to the border and I’ve never felt so safe,” she said. Engineers from 937th Clearance Company of the U.S. Army prepare to place concertina wire on the Arizona-Mexico border. Later that afternoon, we understood her ease. On a horseback ride to the fence, we saw regular patrols by border agents in SUVs and an occasional helicopter or drone overhead. It’s a bit surreal to ride through the desert scrub landscape, where your sight can stretch unimpeded for miles, to abruptly come across the stark reality of the barrier. We rode along the parallel road for a mile, then saw, to us, an incongruity. To the east and the crossing station about a half-mile away, the fence was draped with concertina wire on the American side; westward, there was only fence, no wire. Larissa Milne along the border fence at Sasabe, Ariz., where concertina protection wire abruptly ends. Our wrangler guide, Colleen, explained that they had seen troops add the wire in the fall and that the troops had left a few days later. The next day, we took an ATV tour to the border with Ross Knox and explored the century-old Sasabe port of entry, which had only 35,000 crossings in 2018. Sasabe is such a sleepy no-stoplight town that its landmark business — the Sasabe Store, built in 1920 — doubles as the town watering hole on Saturday afternoons from 3 to 6 p.m. It’s there, at the eight-seat bar, that locals mix with ranch workers and visitors. El Sasabe sits just south of the crossing and is home to 2,500 people, some of whom work at the ranch. A view from Mexico along the border where the barrier ends. We rode the ATVs west along the fence about four miles, where we came across an even more remarkable sight — there the barrier just ends. The desert is wide open. Admittedly, there is a steep hill that provides a natural obstacle, and also this is the beginning of the Tohono O’odham Nation Reservation, which straddles the border. We were able to simply walk around the end of the fence into Mexico. Though this spot might seem easy to cross for someone coming north, the reality is more complex. The terrain is steep and harsh, and Tohono O’odham police officers work in conjunction with border agents to protect their homeland and the boundary that runs through it. Vehicle barriers help curtail illegal immigration and trafficking, and a fence covers flatter parts of the reservation. The tribe is opposed to construction of a proposed 30-foot-high wall along their 65-mile piece of the international line because of the potential impact on residents’ access to vital services, such as water and health care. By contrast, the twin border towns of Nogales to the east, where the interstate connects Tucson, are the state’s busiest port of entry, with 8 million people entering the United States there in 2018. This is a largely industrial crossing, filled with trucks and railcars. The streets of Nogales, Ariz., are lined with warehouses bearing names like Sunny Valley Organics and Fruit Royale, storing Mexican produce on its way north. Border fencing is omnipresent there, including the new necklace of concertina wire. A few weeks before we visited, Customs and Border Protection seized a northbound truck containing 254 pounds of fentanyl, the synthetic opioid creating such a severe abuse problem; it was the largest such seizure at any U.S. port of entry. We parked in a day lot on the Arizona side and walked into Mexico. Nogales is essentially sliced midway by the border fence, and residents pass north and south to shop and work. Businesses on either side of the crossing are curiously different and seem to appeal to those on the opposite side of the fence — the northern side features inexpensive clothing and shoe stores that are marketed toward Mexicans, and the southern streets are lined with souvenir shops, dental clinics, and pharmacies catering to Americans. “Best Deal on Viagra & Cialis” was a popular window sign on the Mexican side, where many medications are available over the counter instead of by prescription. We stopped into Leo’s Cafe for a lunch of chicken molé and tampiqueña (grilled steak with avocado and other side dishes). The avuncular proprietor, Leo, made the rounds of the dining room, offering complimentary shots of tequila. Our return was a sharp contrast to our arrival. A few hours earlier, we had simply walked through a turnstile; now we waited in a line that snaked out of the border crossing building and through a pedestrian arcade lined with Mexicans selling items ranging from silver jewelry to dried chili peppers. We inched forward for 50 minutes, then showed our passports before being allowed back into the United States. We wanted a closer look at the border fence from the American side and found a spot east of Nogales where a Border Patrol agent sat in his SUV parked along the road paralleling the barrier. Considering that he hadn’t been paid in weeks because of the partial government shutdown, he was remarkably friendly. We hiked into the San Rafael Nature Area just northeast of Nogales in search of the ghost town of Harshaw, which had enjoyed a brief silver boom in the 1880s. What remains today are three buildings and a cemetery. We spied some water bottles tucked under an oak tree -- two black plastic gallon jugs, labels in Spanish, tied to one another by a three-foot length of fabric that formed a shoulder sling. Nearby, an official sign partially obscured by scrub warned in all capitals that we might encounter smuggling and illegal immigration there. On this sunny afternoon, there was not another soul in sight. But then a dull buzzing overhead broke the silence; a drone appeared a few hundred feet above, watching. We looked up and waved. The operator was apparently satisfied that the water bottles weren’t ours, and the drone buzzed away. Cowboy poet Ross Knox at Rancho de la Osa. Back at the ranch, we settled in on Saturday evening to hear Ross Knox recite the evocative cowboy poetry for which he has become acclaimed out west. The cantina building, constructed in 1720, is the oldest continuously occupied structure in Arizona. Listening to Knox in the candle-lit room, with his trusty cattle dog, Ben, by his side, it was easy to imagine we had just spent a long day out ridin’ the range. We walked outside into the desert darkness and mesquite-scented air, a lunar eclipse revealing a sparkly starry night that would have impressed van Gogh. There was absolutely no sound, the remote setting taking us back to that time when the border was more of a technicality than a barrier.